Here are some of the features of Windows 8 that Microsoft has made available in this new OS. Developer preview of Windows 8 has been available since last few days, and you can download Windows 8 Free. These Windows 8 Features make it a compelling download. The production version of Windows 8 is scheduled to be launched in 2012, and is creating lot of buzz in technical world. Windows 8 is designed strategically to be used in a 10 inch tablet to big desktop PC’s. Leaked information’s about it has already been released in the internet. Microsoft Windows 8 will have a metro based tiled user interface. It will be able to run the gesture based apps like Mails, calendar, photos etc. (more likely for tablet Pc’s) and side by side will be able to run traditional windows win32 apps which need full screen. Lock screen login interface will be customizable and will use a photo based system. It will give details of emails, instant messages, task manager etc. OS will have multi monitor support which will enable single background among all the screens and task bars. 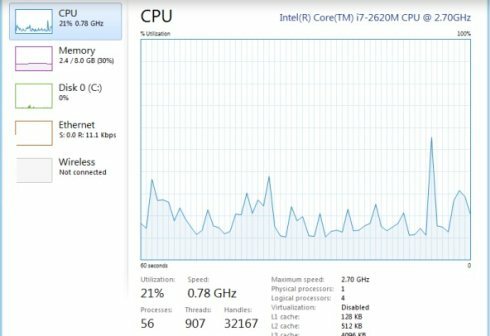 New Task manager can now suspend applications not running on-screen. All cloud based apps will now have Skydive storage support. Windows 8 will now be supported in ARM based devices. Multi touch feature will be supported in Internet Explorer 10. It will come will be more secured as it will have built-in antivirus software. Virtualization software Hyper V will now be coming preloaded in Windows 8. Operating system will have a new control panel for managing PC’s data connectivity plans. Microsoft will also introduce Windows 8 app store to let users download and install software quickly. All these are the main features of Windows 8. There are many more changes that Microsoft has introduced in this operating system. We will cover them in our future articles.